StoreSMART receives Big Freight Savings with FedEx Ground and passes the savings on to you. Same-day Shipping - In stock orders placed by 3 p.m. EST - Monday through Friday (excluding holidays) usually ship the same day. Delivery times are determined by FedEx. Back Order Policy - We inventory thousands of items. Occasionally, a product may be out of stock. If your item is back ordered, we will notify you by phone or email. Your complete order should ship within 3-5 business days. Shipments to the continental U.S. — Orders under 2 pounds are shipped First Class or Priority Mail with delivery confirmation. For heavier packages, we use FedEx Ground. StoreSMART gets Big Freight Savings with FedEx Ground and passes the savings on to you. If your order exceeds FedEx Ground limits, “Common Carrier” will be selected to insure prompt delivery. For heavy, bulky items or equipment, there may be an additional freight charge that will be added to your bill. Also, First Class, Priority Mail, and FedEx lets you track your orders so you can rest easy knowing it’s on it’s way. FedEx will not deliver to P.O. boxes. StoreSMART ships prepaid and will invoice you for the shipping cost. Rush Shipments - You may request FedEx Next Day/Overnight delivery by 8 a.m., 10:30 a.m. or 3 p.m. FedEx 2nd Day delivery is also available. Rush shipping costs need approval. We will email the rush shipping costs for your approval before we ship the order. Inside Delivery - When placing your order, please be sure to specify if you need inside delivery. FedEx Ground does not charge for this service; however there may be a charge if using another truck line. Shipments to Canada - Click here. Shipments to Alaska, Hawaii, and Puerto Rico - Click here. International Shipments - Click here. Shipping Prices - StoreSMART will always try to keep shipping costs as low as possible but occasionally prices will change without notice due to circumstances beyond our control. FedEx Address Correction Charge - Please, please, please… make sure your “ship to” address is complete and includes any apartment, suite, department or floor information. Incomplete information slows the delivery time and FedEx charges an average of $10.00 to $12.00 per box for address corrections. We will charge that additional cost to your credit card when it is billed to us. Payment can be made by check or MasterCard, Visa or American Express. Net 30 credit terms available. You must complete an application for credit. It usually takes 5 -10 business days to process through our credit department. We accept purchase orders from Schools, universities, government agencies, hospitals, libraries etc. Tax-exempt for New York State only - Click here. Copyrights - All our photographs, artwork and designs from StoreSMART.com and ScrapSMART.com are copyrighted. We encourage you to use them. Please contact us for a licensing agreement. 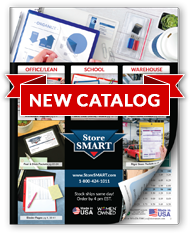 Pricing - StoreSMART works to maintain prices at the lowest level. Occasionally, prices change without notice due to circumstances beyond our control. Stock items may be returned within 30 days for a refund, if you CALL and speak with a live representative. We will then instruct you on the required process. The customer is responsible for all the shipping charges on returned, cancelled or exchanged orders, unless the return is the result of our error. For Returns and Exchanges we must be notified within 30 days of the receipt of your order. Please call 1-800-424-1011 or 585-424-5300. The customer is responsible for shipping charges on returned or cancelled orders. Customer Service will advise you should a restocking fee apply. If you received the incorrect item, StoreSMART will issue a pickup free of charge. Call StoreSMART customer service at 1-800-424-1011 for help in obtaining a correct replacement item. Item must be in original package.